The Moody Classic 45 teams retro-chic with modern engineering, and practicality with short-hand performance. The Moody Classic brief to designer Bill Dixon was to produce a fast, easy-handling yacht range, with as many traditional cabin touches, above and below deck, as possible. With that in mind, it's safe to say the brief has been well and truly met. Walk along a dock to rendezvous with a Moody Classic 45, and you're faced with a pleasing, cream-coloured hull with teak-faced cockpit floor, and the sweetly curved deck sheer and tucked stern, surmounted by a low coach house with oval ports. In contrast with these traditional accents are a plumb stem, drop-down swim platform and a cockpit wide enough to accommodate twin wheels. Once aboard, it can be seen that the rig and sail handling equipment is state-of-the-art, and, although a self-tacking jib is a traditional feature, its set-up is Hanse-modern, not club-footed like the staysails of older yachts. An option, not fitted to the test boat, is a second furler for a reaching sail that can be tacked to the stubby sprit/anchor roller. Another Hanse influence is revealed in a pair of leather-clad wheels on either side of a wide walkway. The helmsperson has a choice of fat coaming perches or broad bin-top seats. A teak drop-side table splits the cockpit, and doubles as a useful hand hold and foot brace, as well as providing the base for a chartplotter swivel-mount, if required. A metal-framed windscreen isn't a traditional yacht feature, but the Classic 45 sports a beauty that looks like it was filched from a Riva, or one of those classic, varnished Venetian water-taxis. 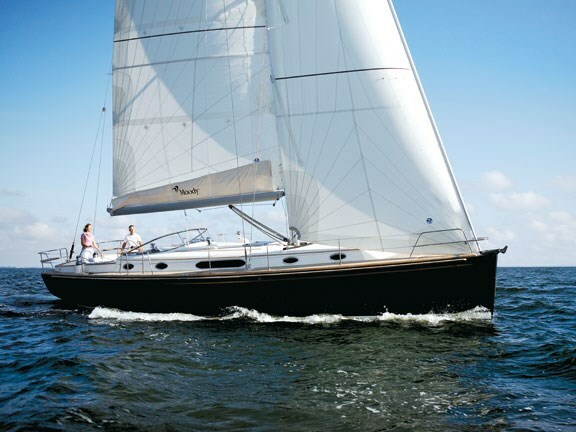 Like the Classic 41, the 45 is designed around modern hull lines and construction. Deep, flat, central sections taper to knuckle bows on both boats, but, in the 45, there is more hull depth and a steeper rocker, fore and aft. Sandwich foam core is used below the waterline, and balsa above, including the deck moulding. The gelcoat is isophthalic and the first layer of laminate is vinylester. Under the cabin sole is a massive ladder-frame strengthening structure, with individual pockets for huge keel bolts. 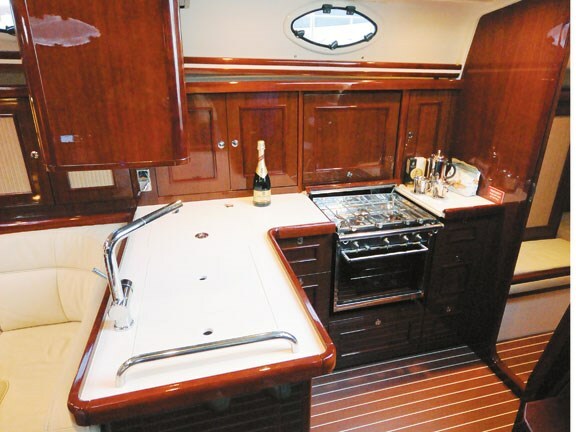 Slip down the narrow companionway – on curve-edged steps with rubber friction pads, inset in stainless steel frames – and you enter another world: one that is reminiscent of "proper yachts" of yesteryear, with highly-polished, deep mahogany timber that contrasts against cream leather upholstery. The Moody Classic 45 dinette is similar in arrangement to that in the 41, albeit with a larger, U-shaped table, around which you can seat six comfortably. 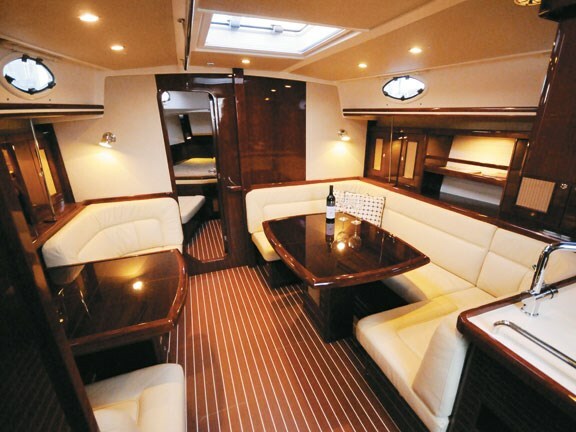 The 45's dinette also has more beam space, two extra seats either side of a chart/coffee table and a wood-screened cupboard above this that could easily house a flatscreen TV. 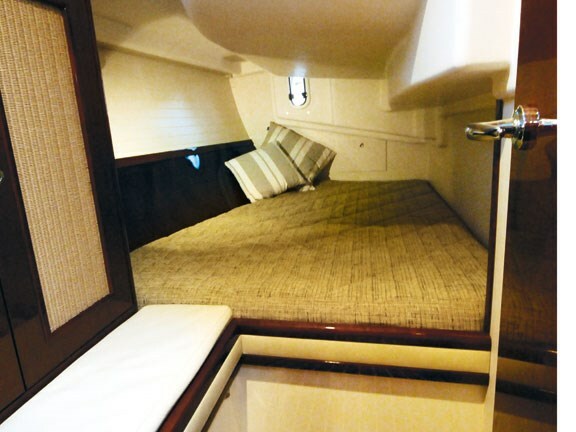 Walkthrough access on a teak cabin sole leads to forward and aft heads and cabins where additional boat length is also put to good use, with a forward cabin that has more saloon head and galley space than the 41. Indeed, whereas a forward head is standard in the 45's much roomier forward cabin, it's somewhat of a squeezed option in the 41. The 45's galley is L-shaped and decked out in mahogany that my better half wanted to take home. Other features include cream Corian tops, which include sink in-fills that effectively increase bench space, a gimballed three-burner cooktop and oven and an optional microwave. There are six possible layouts in the 41, from two-cabin/one-head to three-cabin/two-head, but the 45 comes with only two layouts, both of which are two-headed: one with dual-aft double cabins and one with a queen bed and vast storage space to starboard. A low coach house and windscreen allow for great vision and the three-blade folding prop provide excellent response, making manoeuvring an easy task. A bowthruster is available, but it needs a tight berth or tidal influences to warrant one. Moody has switched from Yanmar to Volvo Penta for the Classic 45, and the lack of noise and vibration under power is impressive. Being an owner's boat, we didn't give the 45 WOT testing, but 8kts-plus came up easily, with plenty more lever travel available. Winch power, in the form of Lewmar 50 AST halyard manual and 54 AST powered primaries, sets the test boat up with serious sail-handling power, so raising the tri-radial, cruise-laminate North main and sheeting it and the unfurled self-tacker was effortless. The jib is sheeted in Hanse fashion, by a line that runs from curved track blocks up the mast, and back to a primary winch. The main is mid-boom sheeted via a German system, with two cabin-top blocks rather than a traveller. Well-placed clutches allow the jib and main sheets to be locked, freeing the powered primaries for genoa or spinnaker work. The single-pull, slab-reefing system uses blocks at both cringles to ease the crew's muscle load. In conjunction with an autopilot, the Classic 45 could be a single-handed boat, where one person could make and shorten sail, in addition to trimming. 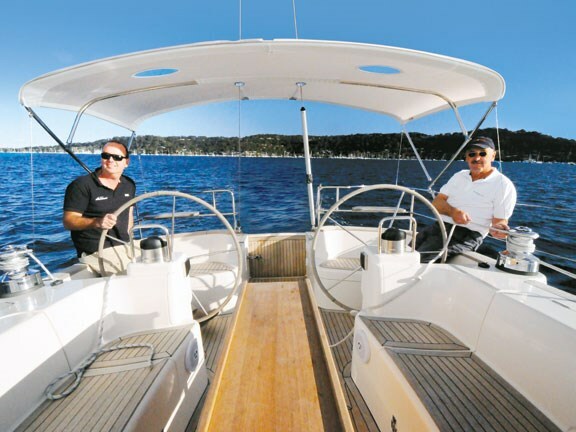 Our test conditions were typical: mid-winter, Pittwater westerlies, varying from three-knot lulls to 15-knot puffs. These conditions matched those that prevailed towards the end of our Classic 41 test, so a direct comparison of both boats in self-tacking headsail mode can be made. The Classic 45 is nearly one-third heavier than the 41, with the same mainsail area and a jib that's only 10 percent larger, so it was no surprise to find the 45 a bit slower on the wind in light breezes than the 41. With sheets eased, the longer waterline of the 45 came into play, and it edged ahead. Moody's polar diagrams confirmed our findings: the 41 is good for around 6.8kts at 40° true in 10kts of breeze, and the 45 around 6.5kts. Both boats are respectable performers, given their cruising vocation, but the more nimble 41 would be our choice for a club racer/cruiser. A deeper hull with more storage space makes the Moody Classic 45 more of a passagemaker than the 41. 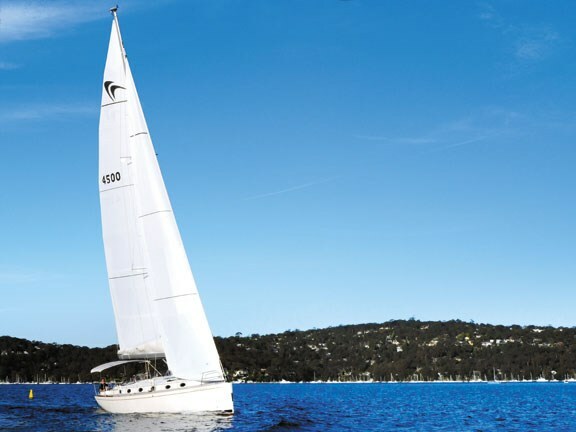 The boat is surprisingly fast when two-sail reaching, and its performance is combined with an ease of handling provided by a self-tacking jib and mid-sheeted boom. For more information on Moody yachts contact Tony Newmarch Marine Brokers, ph 09 413 9465, email tony@moodyyachtsnz.com. It's sad to see so many of Britain's manufacturing businesses moving into offshore hands, but, given the choice between the more traditional looking Moody Yachts or German-made Moody Yachts, the decision is an easy one. Initial scepticism following the Hanse Group takeover of the struggling Moody brand was dispelled by the launch of the Moody Classic 41, and this boat's larger yard mate, the Classic 45. England's Moody Yachts has a pedigree that dates back to 1827, through five generations of family ownership at the historic River Hamble site. However, that lineage ended after an amazing 180 years, when, in April 2007, ownership of the famous brand crossed the English channel and passed into the hands of Hanse Yachts, which almost immediately began producing Moody Yachts in Greifswald, Germany. To ensure that Moody Yachts' design continuity was preserved, Michael Schmidt retained designer Bill Dixon, who has been penning Moody lines since 1981. Visit www.tradeaboat.co.nz for current listings of used Moody boats.